There is an old saying in the world of antiques, it goes something like this, “never buy anything that you would not be happy to live with or have in your home.” There are countless variations of that sentiment but, in essence, it means that in most cases you shouldn’t buy something unless you like it. Why, you ask, would anyone buy something that they didn’t like. The answer of course, is that they think it is underpriced and hope to be able to sell it on at a profit in the future. Nothing wrong with that of course but, in our experience, it’s not why most people buy antiques – they buy them because they love them, they look good in their homes or perhaps in a commercial space such as a hotel, restaurant or even in the office. Many people who buy antiques are in fact collectors. They are always on the lookout for an item that they don’t yet have. A particular pattern or design, the work of a particular craftsman or artist. There are many examples of this and it is one of the roles of an Antiques dealer to offer those items for sale when they appear on the marketplace. You can always ask us to let you know when the items you are looking for become available – just follow this link and give us the details, we will notify you when new items in your areas of interest are listed. Here at Regent Antiques we operate along those lines. We are proud of every item we offer for sale and we are delighted when one of customers is delighted with their new purchase. Of course the value is important, we want our customers to feel that they have obtained a fair price for an item that has been accurately described. If you are able to visit our north London showroom you can, of course, see and feel the items you are interested in before you decide whether to buy. If you are shopping online however that is not the case, which is why we always provide a wide range of photographs for our products and offer the services of our experts to answer your questions by telephone or email. However you find us, however you buy, we want you to be pleased with your purchase. Here is a selection of items that have found new homes in the last few weeks. 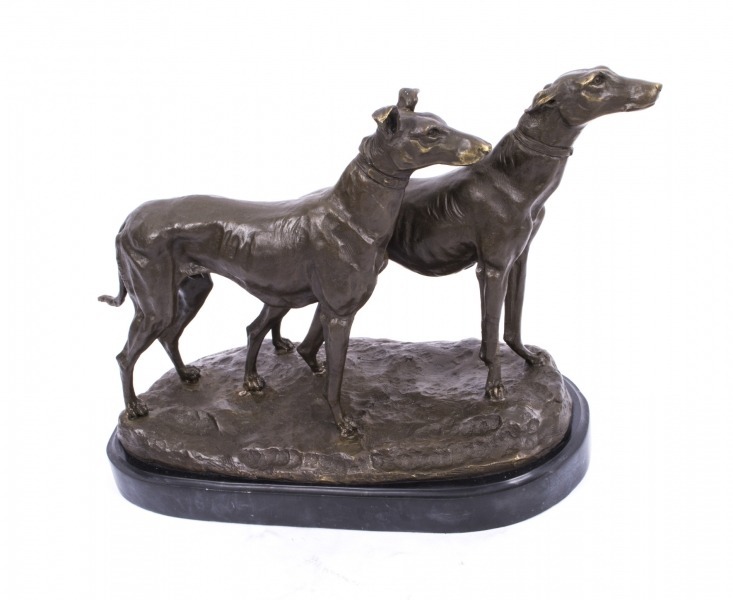 An attractive bronze sculpture depicting a pair of greyhounds, dating from the last quarter of the 20th century with the original being attributed to the French sculptor, Emmanuel Frémiet (1824 – 1910). Whether the new owner of this fine bronze is a lover of dogs or a fan of Frémiet we do not know but what we do know is that it is a top quality bronze that has been made using the traditional “lost wax” process and bears the signature of Fremiet. The attention to detail shown by Fremiet is of the highest level and this sculpture, which is set on a marble base, is very lifelike. It measures only 28cm high x 40cm wide and 19cm deep, (11in x 16in x 7in), but will attract the attention of anyone who is in the room with it due to the realistic pose and energy of the piece. The sculptor has done a great job of capturing the joy of owning such beautiful dogs. 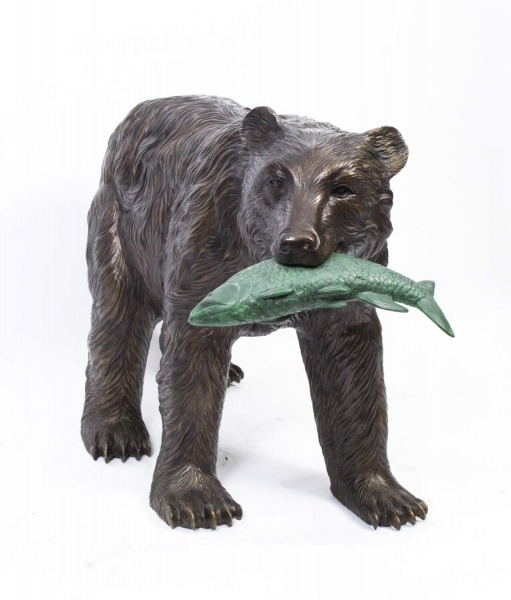 An impressive bronze sculpture of a grizzly bear with a lovely dark brown patina carrying a contrasting green patinated salmon in his mouth. Supper’s ready! 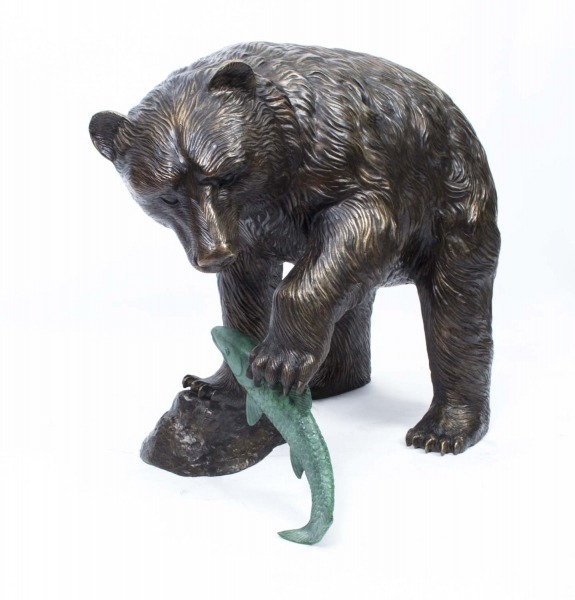 Also sold was this bronze of, presumably the same bear, actually caught in the act with the salmon in his paw. 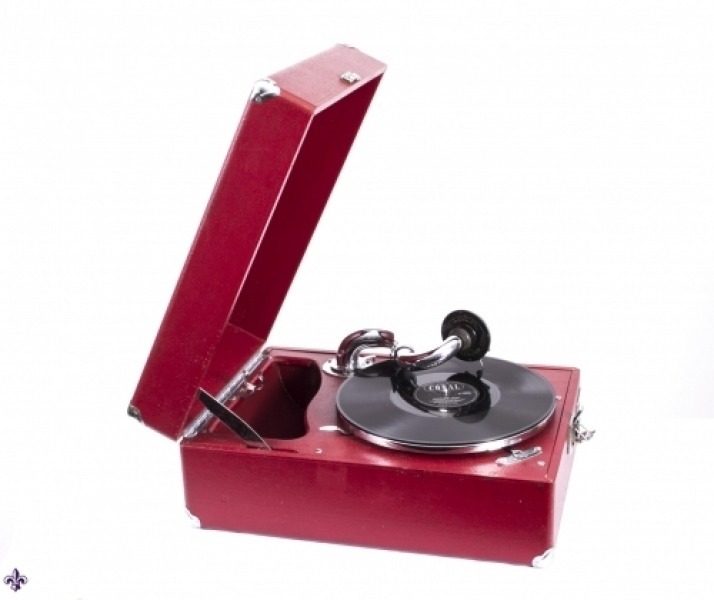 Actually, this is one of two such vintage HMV gramophones sold by us recently, this one being the “de-luxe” variant finished in black leathercloth – the other was finished in red. This model of graophone was extremely popular in its day and managed to combine good looks with superb playing quality and portability. In fact, the HMV 102 is still widely recognised as the pinnacle of portable gramophone design and remained in production, with minor changes, from 1931 until the late 1950s. 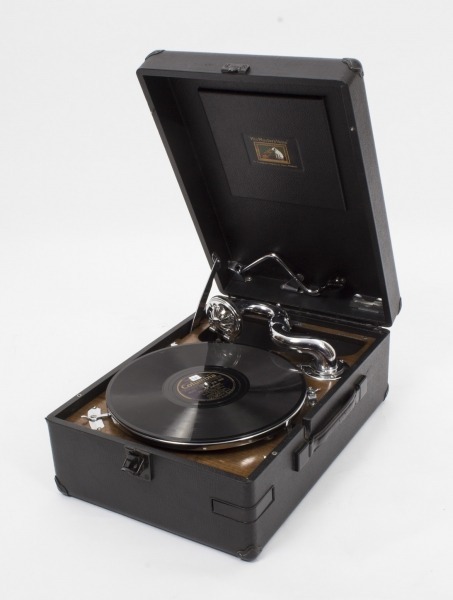 This particular item also included a rare addition – the disc carrier fitted inside the case to carry your discs safely around with you, inside the gramophone, when travelling. The manual was also supplied. There are many collectors of Art Deco furniture and other items in the Art Deco style but furniture is probably one of the most popular categories. Furniture often has to be not only attractive but also functional and there can be no better example of that than with this pair of cabinets. 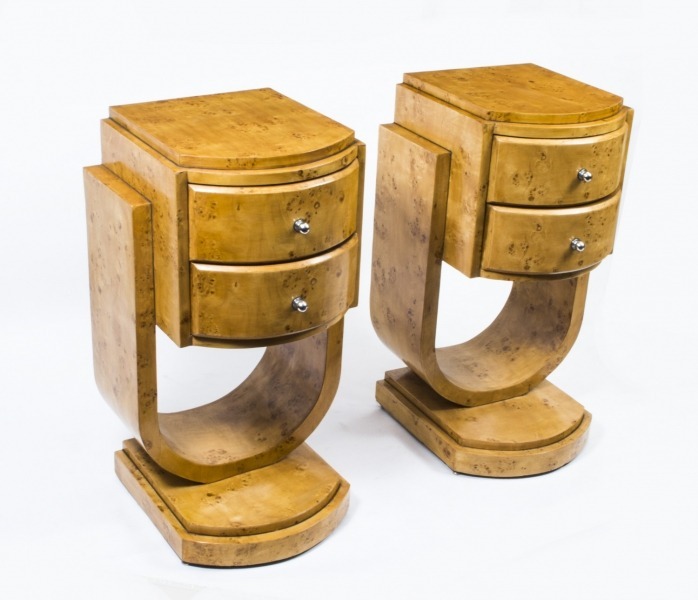 They certainly tick the box when it comes to looking good with their beautiful birdseye maple finish and typically curvy Art Deco style but they also make very useful bedside cabinets, each having two useful drawers. These Art Deco cabinets each measure 84cm high x 48cm wide and 45cm deep and are therefore both compact and practical. 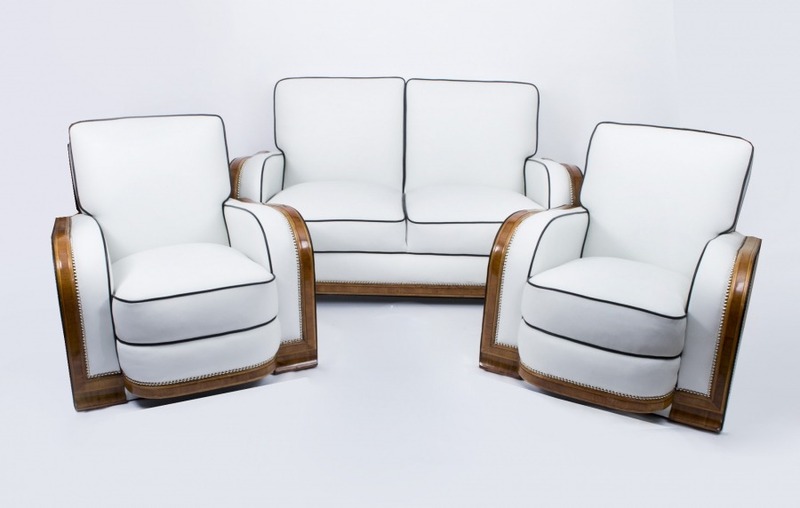 Two very fine examples of Art Deco furniture that you have missed – but take heart, we have more for you to see here on line or at our showroom. Art Deco lovers were out in force recently at Regent Antiques because, not only did we sell the lovely Art Deco bedside cabinets described above but we also said goodbye to this stylish antique Art Deco Period three piece suite dating from around 1930. This lovely suite would not be out of place in the lounge of an ocean going liner plying its trade back in the 1920s or 30’s in those years between the wars when Art Deco was a massive movement covering interior decoration, furniture, art, especially sculpture and other things as well. No shortcuts were taken with this lovely suite, it has been lovingly restored in our own workshops and tastefully re-upholstered in fine Ivory leather with black piping. The frames are constructed from nicely figured walnut and birch which serves to showcase the lovely leather seating. Our final item selected from the sales over the last few weeks is this antique Edwardian Flame mahogany string inlaid and satinwood crossbanded pedestal kneehole desk, circa 1900 in date. 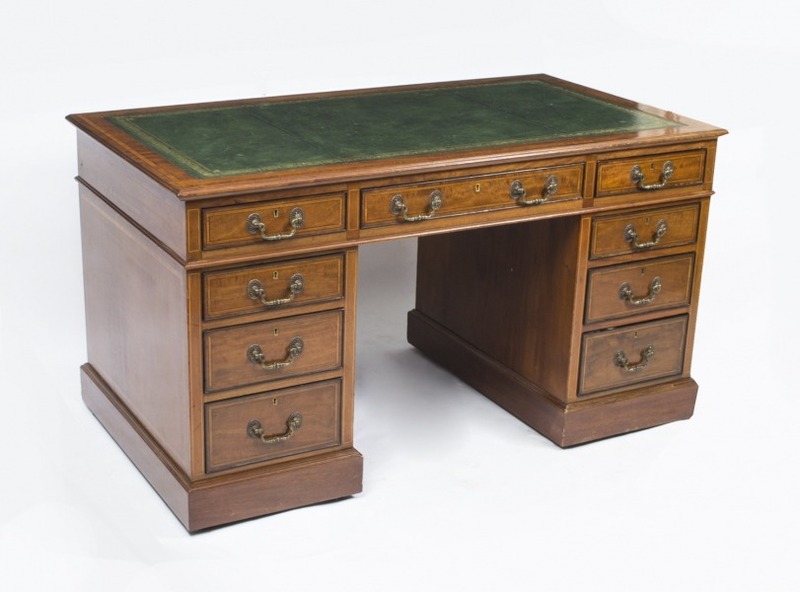 This lovely desk is made from flame mahogany and still has the original rectangular olive green gold tooled leather insert and the desktop also features an ogee moulded edge. As you can see, there is storage space aplenty with three drawers in the frieze ogether with three graduated drawers in each pedestal. The desk has it’s original brass swan neck handles and the new owner is no doubt pleased that the locks bear the stamp of the renowned locksmith Hobbs & Co.
That’s it for this round up of items recently sold by Regent Antiques, online or at our London showrooms. There’s still time to find that special item before Christmas so let our experts help you to find what you are looking for. If you can’t visit in person then call us on the number shown above or email info@regentantiques.com. We ship worldwide but don’t leave it too late if you are buying presents for Christmas.